There are eight playable races in Arena, each with different characteristics. It is important to choose one that will complement your character's class, though it is not a necessity. 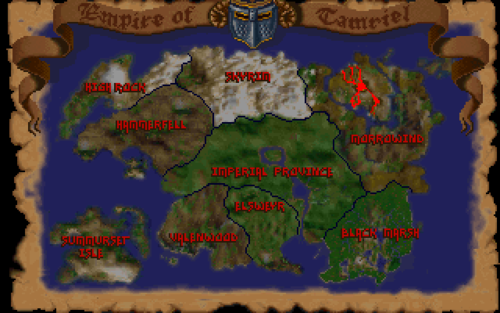 Before the game starts, you are shown a map of Tamriel, which allows you to choose which race you want to be by clicking on the appropriate province (there is no race associated with the Imperial Province). When you exit the Imperial Dungeons, you will emerge in the homeland of whichever race you choose to be. The table below shows from what province each race originates. Arena's map of Tamriel. From where dost thou hail? Here is a brief description of each of the races, their strengths, and their suitability to a particular class. "Thou hast chosen Black Marsh, land of the Argonians." Argonians are a highly evolved race of reptilians, at home in any marsh-like environment from which they hail. They are known for their intelligence, agility, and speed. Because of their reptilian nature, Argonians do not tire easily while swimming, and seldom drown. They can also swim faster than any other race. They are adept in any art involving the arcane, or involving thieving and sleight of hand. "Thou hast chosen High Rock, land of the Bretons." "Thou hast chosen Morrowind, land of the Dark Elves." Dark Elves are a tall, dark-skinned people with red, glowing eyes. They are known to be extremely strong and intelligent, and very quick. Dark Elves seem innately tuned to weaving magic with weapons. Dark Elves receive their (level / 4) as a bonus to hit and damage with any melee or ranged weapon. They are adept in any art involving the blade and shield combined with the arcane arts. "Thou hast chosen Summurset, land of the High Elves." High Elves are a tall, golden-skinned people with almond-shaped eyes. High Elves are extremely intelligent, agile, and willful. High Elves seem drawn to magic as a moth is to flame. They have a natural affinity to its use, and often make quite formidable wizards. High Elves are naturally immune to paralyzation. They are adept in any art involving the arcane. "Thou hast chosen Elsweyr, land of the Khajiit." Khajiit are a fair-skinned people who are extremely hardy, intelligent, and agile. Legend has it that they descended from an intelligent feline race, for they still retain a strange cast to their features. Many Khajiit have taken to painting their faces to more resemble their distant cousins, the predatory cats that hunt the great desert. Khajiit are expert climbers, able to scale chasm wall sides with speed unmatched by any other race. They are adept at all arts involving thieving and sleight of hand. "Thou hast chosen Skyrim, land of the Nords." Nords are a tall and fair-skinned people who are strong, willful, and hardy. Living in their arctic environment has inured them to its effects, for they seem to shrug off all but the coldest of attacks. Nords take half damage from Cold based attacks, and on a successful saving throw take no damage. They are excellent in all arts concerning the blade and shield. "Thou hast chosen Hammerfell, land of the Redguards." Redguards are a stocky, powerful race that are known to be extremely hardy and quick. Legend has it that the Redguard are innately more proficient at weapons than any other race. Redguards receive their (level / 3) as a bonus to damage with melee weapons. Redguards have a hit bonus which depends on their level. They are excellent in all arts concerning the blade and shield. "Thou hast chosen Valenwood, land of the Wood Elves." Wood Elves are a people of the forest, matching their features to all that is found growing in the green woods of their homeland. They are known to be extremely agile and quick. Due to the bug, Wood Elves receive their (level / 3) as a bonus damage with bows. Wood Elves have a hit bonus which depends on their level. They are well suited towards any class, although their nimbleness serves them best in any art involving thievery. Every race shares two different default clothing options. One with a brown or white shirt, and the other with a green tunic. Orcs are treated as enemies akin to goblins, they are not considered on a par with other races. The Imperial race was introduced in later games; there is no specific race attached to the Imperial Province in Arena. The Khajiit are likely of the Ohmes species, due to their tattooed faces and more humanoid body shape than Khajiit depicted in later Elder Scrolls games. The elven races are only referred to using the names Dark Elf, High Elf, and Wood Elf. The mer names Dunmer, Altmer, and Bosmer (respectively) were introduced in subsequent Elder Scrolls games.